Are you in the market for the best induction cookware? Perhaps you have added an induction cooktop or stove to your kitchen and want to add to your culinary collection. 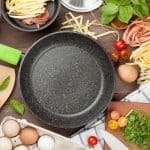 Since there is an abundance of options available, we have selected what we think are some of the top rated picks for the best induction cookware sets. We describe their features and list their pros and cons so you can decide which one will suit you best. All of these sets can also be used on gas, electric, radiant and ceramic stovetops. * They will not honor the warranty if there is damage from use of an automatic dishwasher. ** The Cuisinart Use and Care guide cautions that regular dishwasher use will eventually scratch any utensil. Anolon is a brand of Meyer corporation which is headquartered in Vallejo, CA. The subject of this review is the Anolon Nouvelle Copper Hard-Anodized Nonstick 11-Piece Cookware Set . These cooking vessels are compatible with all stovetops including induction hobs and are oven safe up to 500ºF. Anolon Nouvelle Copper Hard Anodized Nonstick pots and pans feature a base constructed with five layers of material. These layers, from exterior to interior are: magnetized stainless steel cap, aluminum, copper, aluminum, and the hard anodized aluminum cooking vessel. The magnetic stainless steel cap (impact bonded) makes the set induction compatible. The copper and aluminum layers are good heat conductors. 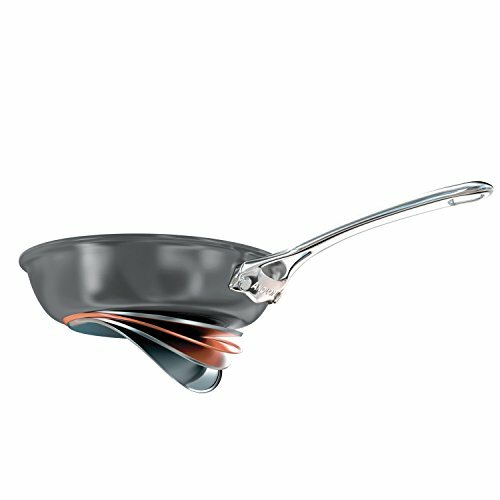 According to both Chemours (spin-off from Dupont) and Anolon, the interior non-stick coating system is DuPont -Autograph 2. This coating is PFOA free, however, it does contain PFTE. Chemours claims this is one of DuPont’s more durable and high performance non-stick coatings. The benefits of this coating are: 1) foods are easily released from the pan, 2) cleanup is easy and 3) metal utensils can be used. These cooking vessels are sturdy and have the right amount of weight. They are not lightweight but not too heavy either. The handles are made of cast stainless steel, have a comfortable grip and don’t get hot. They are securely attached to the pot or pan using rivets. 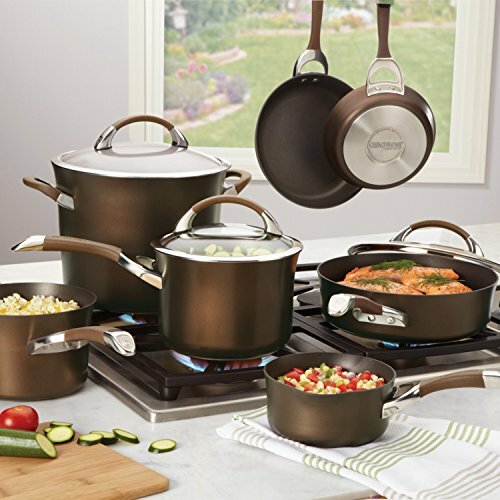 One of the best attributes of this Anolon Nouvelle Copper Hard Anodized cookware set is that the rivets are flush with the cooking surface and are covered with non-stick coating. The lids are stainless steel. As I own the open 8.5” and 9.5” French skillets, I cannot attest to whether the lids lock in heat and moisture. However, many verified purchasers on various websites have stated the lids do fit securely. This line of cookware is manufactured in Thailand. Do not put in the microwave. Do not use in the broiler. Anolon states this cookware set is oven safe to 500ºF. I would not use the pans over 425ºF or 450ºF. This gives some leeway in case the oven thermometer is not correct or Anolon’s quality control is less than perfect. Do not use cooking spray. Use a stove burner that matches the size of the bottom of the cooking vessel. Hand wash with a non-scratch or nylon sponge. Anolon states in their literature metal utensils can be used on these pots and pans. Using only wooden or silicone utensils lessens the chance of the pan getting scratched. 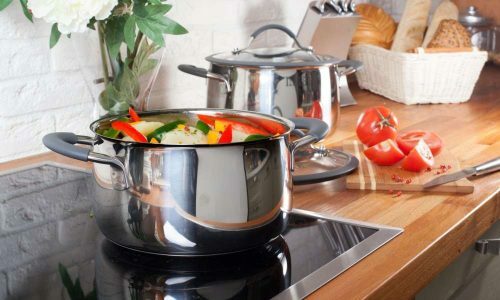 The Duxtop Whole-Clad Tri-Ply Stainless Steel Induction Cookware Set is a high-performance cookware that can be used on induction, gas, electric, radiant and ceramic stovetops. The whole clad, three layer composition throughout the base and sidewalls of these pots and pans ensures thorough and even heating. Although you could use the 3-quart saucepan for preparing rice, an induction rice cooker produces perfect fluffy rice. The pots and pans in this cookware set have a tri-ply composition of two layers of stainless steel with a layer of aluminum in the middle. These three layers extend through the bottom and sidewalls of all pots and pans. The inner layer is 18/10 stainless steel and the outside layer is 18/0. The interior has a satin finish the the lids are stainless steel. These cooking vessels are not so heavy as to be cumbersome, but are not what I would consider lightweight. The stainless steel handles are securely riveted to the pan and stay cool to the touch even after being on the stove for a long time. This cookware can be used up to 550°F, and is safe for food storage in either the refrigerator or freezer. Although these pans and pots are dishwasher safe, hand washing is recommended. 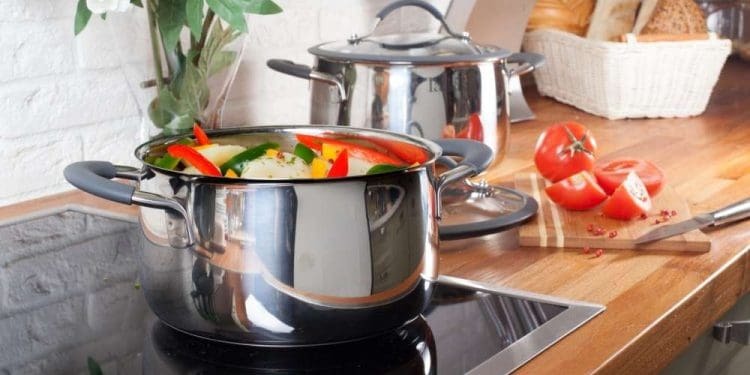 The Cooks Standard 10 Piece Multi-Ply Clad Cookware Set is a high-quality, durable cookware set that is suitable for induction cooktops, as well as ceramic glass, gas and electric stoves. This versatile set is a great addition to a current stainless steel cookware collection or a replacement for non-stick cookware. One of the drawbacks of this set is the lack of a skillet or frying pan. Cuisinart offers a very nice 10-inch frying pan manufactured in France. A well-designed 12-inch skillet with a handle helper is also available (manufactured in China). This induction friendly set is constructed of an aluminum core sandwiched between two layers of stainless steel. These three layers are throughout the base and sidewalls of the pots and pans. The interior layer is 18/10 stainless steel. The bottom is scratch resistant and composed of magnetic stainless steel making it induction compatible. The interior has a brushed satin finish while the exterior has a smooth and highly polished finish. The cooking vessels are well balanced, due to their weight, construction and design. The pots have been described as being of medium weight to heavy. The bottoms are flat; and the cooking vessels do not rock on the cooking surface. The handles are made of stainless steel and are securely riveted to the pot. They stay cool while cooking due in part to the open V-shaped design placed at the point of attachment to the vessel. The lids are of 18/10 stainless-steel construction and have a loop handle. The Cooks Standard 10 Piece Multi-Ply Clad Cookware Set, is affordable, durable and manufactured with high-quality stainless-steel. The heat is evenly distributed throughout the bottom and sides of the cooking vessels. 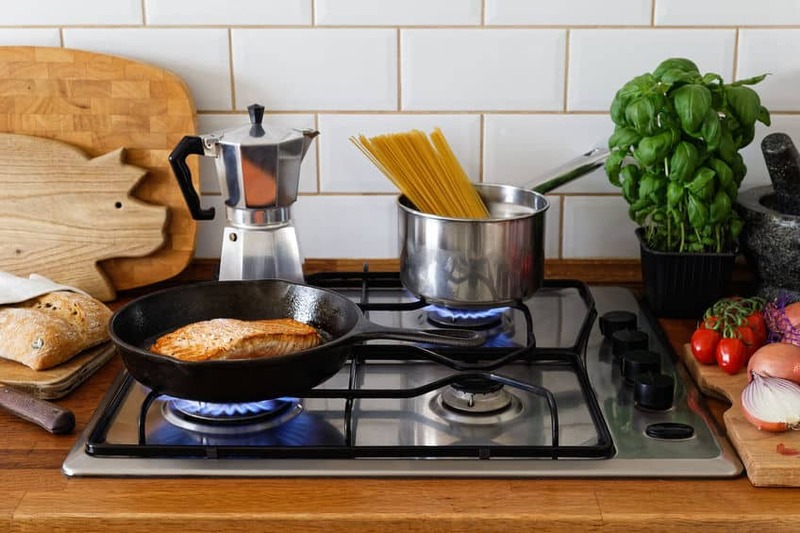 For successful meal preparation using stainless-steel, be sure to use the correct heat (lower than when using electric or gas stoves) and pre-heat the pan the pan properly before adding oil and food. One of the great benefits of cooking with stainless steel is being able to transfer food from the cooktop to the oven. The Cooks Standard cookware warranty is clearly stated in the paperwork accompanying their products. For this set, a limited lifetime warranty is offered. Cooks Standard will repair or replace any item found defective in material or workmanship. However, the warranty does not cover damage caused by accident, misuse, abuse or commercial use. They will not honor the warranty if there is damage from use of an automatic dishwasher. Additionally, damages such as scratches, stains, discoloration, or damage from overheating are not covered. Cooks Standard is a brand of Neway International Inc, a privately held company and has been registered in the State of California since 2007. It has been a registered trademark of Neway International Inc. since July, 2012. Responsive and prompt customer service is important to me. Some companies do not have telephone customer service and offer only an email contact form. Not all companies who have these forms, answer queries. However, Neway International Inc. provides great telephone and email customer service. When I called Neway, the man who took the call answered my question quickly. An answer to my email query was received within 10 minutes. The Cuisinart MCP-12N Multiclad Pro Stainless Steel 12-Piece Cookware Set is comprised of durable, high-quality pots and pans that can be used on induction, gas, electric, glass, and halogen cooktops. These pots and pans are oven safe up to 500ºF. The lids for the 1.5 qt saucepan, 3 qt and steamer insert also fit the 8” fry pan. The 8 qt stockpot lid will fit the 10” fry pan. The steamer insert sits on top of the 3 qt saucepan. The pots and pans (excluding the steamer insert) of this Cuisinart cookware set have two layers of stainless steel with a layer of aluminum between them. 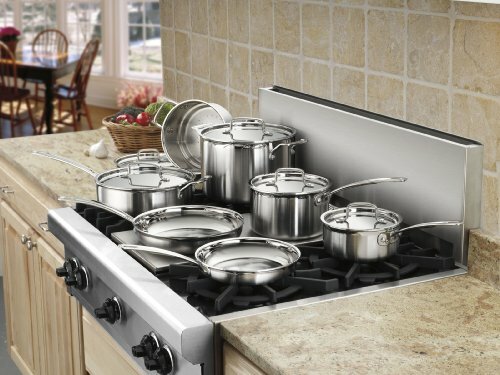 The bottom of the pots and pans is magnetic stainless steel making it compatible with all types of induction cooktops. The three layers along the base and side walls of the cooking vessels produce fast and even heat distribution. The exterior finish is brushed stainless steel while the interior is polished stainless steel. 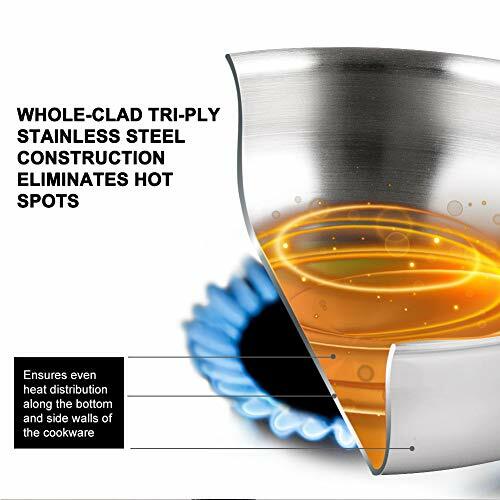 The rims of all cooking vessels are tapered which eliminates liquid dribbling when pouring. The handles are stainless steel and are shaped ergonomically. An added benefit is that they are designed at an angle making it easy to lift, pour and maneuver in general. They stay cool while cooking and are attached with stainless steel rivets. However, it is always a good idea when using cookware in an oven to take safety precautions. The lids are made of stainless steel and have a ridge that helps further secure the lid on the pan. This keeps the liquid and nutrients from escaping. There is a lot to like about the Cuisinart MCP-12N Multiclad Pro Stainless Steel 12-Piece Cookware Set. It is durable and well-designed. The most important feature of this set to me is that the bottom and sidewalls of the pots and pans are constructed using two stainless steel layers and an aluminum core. These Cuisinart stainless steel lids fit well and the handles on them are designed so they can be held effortlessly. The handles on the pots and pan don’t get hot, are securely riveted, and are shaped and angled in such a way that makes them easy to maneuver. This Cuisinart MCP-12N Cookware Set is reasonably priced and is a high-quality product. It is an affordable starter set for those learning to cook or are out on their own for the first time. For those consumers who want to replace their nonstick cookware pieces with stainless steel this Cuisinart cookware set is worthy of consideration. When I read product reviews I look for patterns. One issue that I noticed was that even though the Use and Care manual states the cookware is dishwasher safe, some consumers recommended hand washing the pots and pans. Additionally, in Cuisinart's Use and Care guide, they caution that regular dishwasher use will eventually scratch any utensil. A non-lemon detergent is recommended. I would like to know the grade of stainless steel used in the construction of the pots and pans. Cuisinart offers a lifetime limited warranty on this cookware set. If a product needs to be repaired or replaced, the customer pays the cost of shipping it to them and must enclose a check or money order (check the warranty for the amount) for the return shipping fees (California residents have different warranty conditions). The terms are available on the Cuisinart website. I always register my products before using them to avoid a hassle with the customer service warranty department. Once the cookware is unpacked, check for dents and scratches as well as ensuring the bottoms are flat and do not rock on the cooking surface and for bumps on the interior of the pans. Cuisinart also makes available on their website, a straightforward Use and Care Guide. NOTE: The grade of stainless steel used to manufacture this set is unknown to this reviewer. The Cuisinart website does not give this information nor does the customer service department of either Cuisinart or its parent company, Conair Corporation. To ensure a complete Cuisinart cookware review of this set, these companies were contacted via telephone. The representatives stated they did not know the grade of stainless steel used in the manufacturing of this Cuisinart multiclad set. In 1971, Carl Sontheimer, an MIT trained engineer, and his wife, Shirley, saw a demonstration of a food preparation machine while on vacation in France and decided to manufacture a food processor that could be used in American homes. They named the company they formed, Cuisinart and began to import to the United States top-quality stainless steel cookware. In 1973, the Sontheimers exhibited their food processor in Chicago. In 1988, they sold the company to a group of investors who a year later, sold the company to Conair Corporation, a U.S. based manufacturer. Conair expanded the Cuisinart line to include a wide variety of kitchen related products. In April 2005, the Multiclad Pro line was introduced. The video below is a demonstration of eggs being cooked using a new Cuisinart frying pan. It proves that with the right preparation (pre-heat pan, check the pan to make sure it is up to temperature, add fat, make sure the pan is coated with fat) eggs won’t stick to this Cuisinart skillet. The section that shows the narrator frying the eggs begins at the 3:38 mark if you want to skip his discussion of the MCP-12N set. 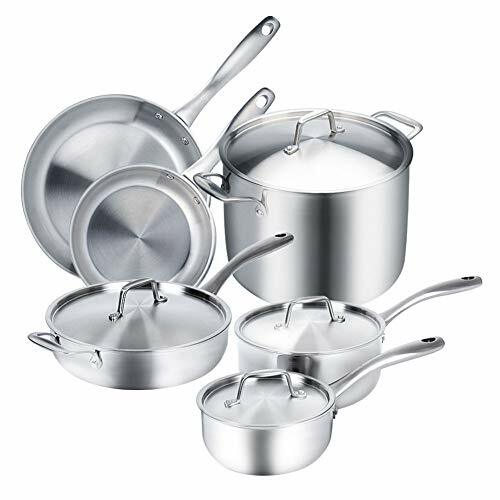 The video below provides a short description and features of each piece of this Cuisinart stainless steel set. Circulon is a brand of Meyer corporation with headquarters in Vallejo, CA. The subject of this review is the Circulon Symmetry Chocolate 11-Piece Cookware Set. The pots and pans of this cookware set are constructed of hard anodized aluminum, a three-layered non-stick coating and a magnetized stainless steel base making them induction friendly. These cooking vessels are compatible with all stovetops including induction cooktops, oven safe up to 400ºF and are manufactured in Thailand. 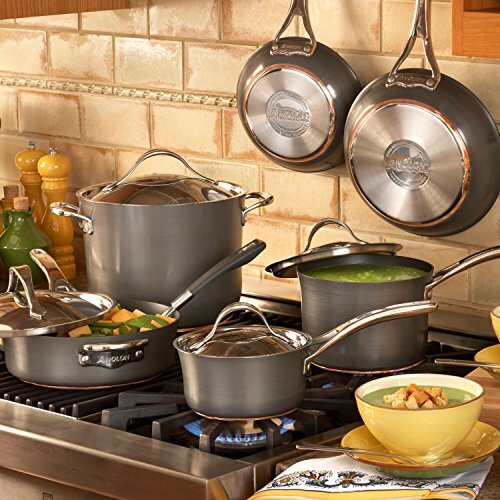 This induction stove cookware set has almost all the pieces needed to fully outfit most residential kitchens. The only piece lacking is a 12 inch skillet. The cookware pieces in this Circulon Symmetry Cookware Set are comfortable to hold and have a solid feel to them. The handles are cast stainless steel with a rubber covering. They are attached to the pot or pan with what appears to be two silver screws. The shatter-resistant lids are made of tempered glass. 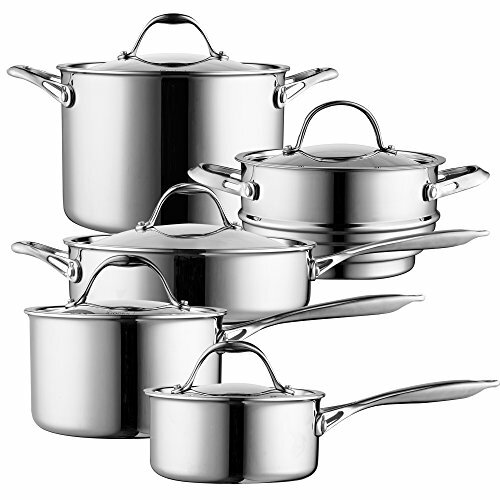 The pots and pans in this set are made of heavy gauge hard-anodized aluminum. Hard-anodizing is an electrochemical process that forms a very hard, abrasion resistant, porous oxide film on the metal, in this case, the aluminum. This thick oxide layer also provides better adhesion for the primer coating layer than you would have on a bare metal. The benefit of this process is that the pot or pan doesn’t have a soft aluminum surface. Instead it is hard, corrosion resistant, and less prone to being scratched. 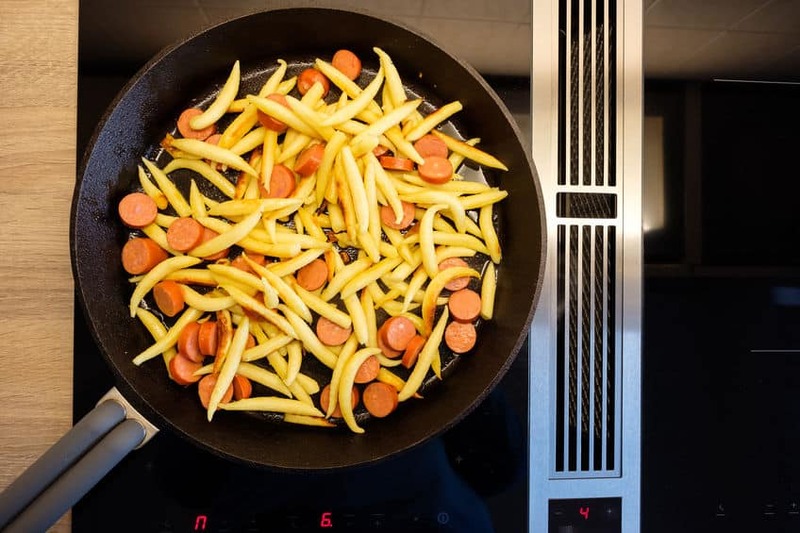 The Meyer Corporation developed the Total® Non-stick system to protect the cooking surface and to keep food particles from sticking to the cookware. There are two components to this patented system. The first, is the hi-low groove design. The cooking surface has raised circles that are closely spaced with high and low areas that resemble grooves. One advantage of this design is that it reduces the tendency of food particles to stick in the valleys (low areas). Another is that while cleaning, the contact of implements or materials is likely to be with the peaks (high areas) of the grooves thus leaving the valley undamaged. The second part of the Total Non-Stick System is the non-stick coating. The name of the coating used in the Circulon Symmetry Hard Anodized 11-piece cookware set is not given on the Circulon website. Three separate layers of coatings are applied to the cooking surface. This coating system reduces the amount of food that sticks to the surface and prevents the grooves from wearing away, thus extending the life of the cooking vessel. Circulon customer service verifies the coating system is PTFE based and PFOA free (see the FAQ section for an explanation of PFOA). The nonstick coating is applied to the exterior as well. The base is magnetized stainless steel which is compatible with all stovetops including induction. An impact bonding machine is used to form the bond between the base of the vessel and the disc. No adhesive material is used. The disc is placed on the bottom of the cooking vessel, and when it is passed through the machine, pressure and friction are applied and the bond is formed. These Circulon pots and pans are dishwasher safe. However, they are very easy to clean if you prefer hand washing. Even though Circulon states in their marketing materials metal utensils are safe to use, some cooks prefer wooden or silicone implements. Consumers can submit a warranty claim if they believe an item is defective. A warranty request and product photographs showing the defect are transmitted to Circulon using the Circulon.com/warranty link. If Circulon finds it meets their warranty conditions, they will replace it with the same item or one of equal or similar value. What materials are induction compatible? The bottom has to either contain iron or have a layer in the base that has magnetic materials. Enamel cast iron, cast iron, carbon steel, and stainless steel pots and pans with a magnetized base are induction ready. If a copper or aluminum pan has a magnetized base, they will also work on an induction cooker. 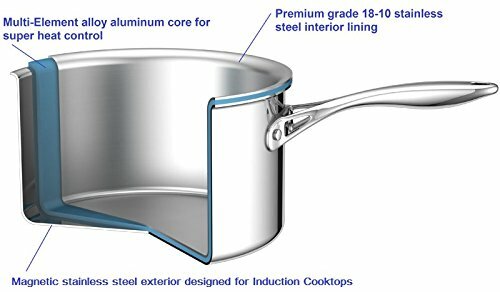 What factors should I consider when buying an induction cookware set? 1. Match cookware to your cooktop. If you have an induction cooktop, the cookware has to be induction compatible. Flat-bottomed pans are critical for cooking on smooth top ranges. If you cook a variety of meals often, then a cookware set is probably a cost effective choice. However, if you only use a frying pan and a saucepan then purchasing two quality pieces is a good option. 3. Type of cookware material. Do you prefer stainless steel, carbon steel, nonstick surfaces, or cast iron? Consider the weight of both the cooking vessel and lid. A heavy-bottomed pan and one with thick walls last longer and are less prone to warping. Would you rather have stainless steel or silicone coated handles? Are the handles sturdy and well-attached? Is it important for you to have a handle with a thumb rest? Do you prefer welded or riveted handles? Do you prefer glass or stainless steel lids? If you choose a set with glass lids, check to see if there is a vent. Can induction cookware be used on gas and electric stovetops? The cookware sets reviewed here can be used on gas, electric, glass and induction cooktops. What is the difference between a skillet, a frying pan, and a sauté pan? The terms skillet and frying pan are often used interchangeably. The only difference seems to be that skillets tend to be slightly deeper than frying pans. They are similar in that they both have sloped sides and are used for frying, searing, and browning foods. Sauté pans have straight sides. This allows for more surface area to come into contact with the heat.